A panoramatour is worth a thousand pictures. Who has understood this, wil see that an online panoramic tour is a worthy marketing tool that you should´d understimate. Your restaurant, your business location, your untenant apartment or your vacant property can be presented and shown best. In first place it doesn´t matter whether the panoramic tour is presented based on HTML5, or based on Google Business View technology. Both systems have their own advantages. Call us, we will be happy to assist you to choose the most suitable system for you. 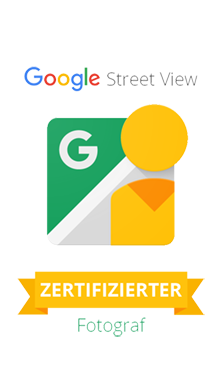 Of course we are Google certified photographer, and with HTML5 panoramas we have many years of experience. Have a look at our examples, (HTML5-based panoramatours and GBP (Google Business View based)), we are sure you will see immediately the advantages for your advertising, whether you want to attract new customers or want to show something new to your regular customers, we can produce your 360° fotography. Even if you need advice for your own 360° projects, we are happy to help. A newspaper article in the Westdeutsche Zeitung (Paywall, 20 free minutes). Again Westdeutschen Zeitung (Paywall, 20 free minutes). The overhead railway station in the prison (Westdeutsche Zeitung) (Paywall, 20 free minutes), and in the Wuppertaler Rundschau.